In 1980, Congressman Charlie Wilson is more interested in partying than legislating, frequently throwing huge galas and staffing his congressional office with young, attractive women. His social life eventually brings about a federal investigation into allegations of his cocaine use, conducted by federal prosecutor Rudy Giuliani as part of a larger investigation into congressional misconduct. The investigation results in no charge against Wilson. A friend and romantic interest, Joanne Herring, encourages Charlie to do more to help the Afghan people, and persuades him to visit the Pakistani leadership. The Pakistanis complain about the inadequate support of the U.S. to oppose the Soviet Union, and they insist that Wilson visit a major Pakistan-based Afghan refugee camp. The Congressman is deeply moved by their misery and determination to fight, but is frustrated by the regional CIA personnel's insistence on a low key approach against the Soviet occupation of Afghanistan. Wilson returns home to lead an effort to substantially increase funding to the mujahideen. As part of this effort, Charlie befriends maverick CIA operative Gust Avrakotos and his understaffed Afghanistan group to find a better strategy, especially including a means to counter the Soviets' formidable Mi-24 helicopter gunship. This group was composed in part of members of the CIA's Special Activities Division, including a young paramilitary officer named Michael Vickers. As a result, Charlie's deft political bargaining for the necessary funding and Avrakotos' careful planning using those resources, such as supplying the guerrillas with FIM-92 Stinger missile launchers, turns the Soviet occupation into a deadly quagmire with their heavy fighting vehicles being destroyed at a crippling rate. Charlie enlists the support of Israel and Egypt for Soviet weapons and consumables, and Pakistan for distribution of arms. The CIA's anti-communism budget evolves from $5 million to over $500 million (with the same amount matched by Saudi Arabia), startling several congressmen. This effort by Charlie ultimately evolves into a major portion of the U.S. foreign policy known as the Reagan Doctrine, under which the U.S. expanded assistance beyond just the mujahideen and began also supporting other anti-communist resistance movements around the world. Charlie states that senior Pentagon official Michael Pillsbury persuaded President Ronald Reagan to provide the Stingers to the Afghans. Charlie follows Gust's guidance to seek support for post-Soviet occupation Afghanistan, but finds no enthusiasm in the government for even the modest measures he proposes. In the end, Charlie receives a major commendation for his support of the U.S. clandestine services, but his pride is tempered by his fears of the blowback his secret efforts could yield in the future and the implications of U.S. disengagement from Afghanistan. The film was originally set for release on December 25, 2007; but on November 30, the timetable was moved back to December 21. In its opening weekend, the film grossed $9.6 million in 2,575 theaters in the United States and Canada, ranking #4 at the box office. It grossed a total of $119 million worldwide—$66.7 million in the United States and Canada and $52.3 million in other territories. On review aggregator Rotten Tomatoes, the film has an approval rating of 82% based on 196 reviews, with an average rating of 6.8/10. The site's critical consensus reads, "Charlie Wilson's War manages to entertain and inform audiences, thanks to its witty script and talented cast of power players." Metacritic reported the film had an average score of 69 out of 100, based on 39 critics, indicating "generally favorable reviews". Audiences polled by CinemaScore gave the film an average grade of "A–" on an A+ to F scale. Some Reagan-era officials, including former Under Secretary of Defense Fred Ikle, have criticized some elements of the film. The Washington Times reported claims that the film wrongly promotes the notion that the CIA-led operation funded Osama bin Laden and ultimately produced the September 11 attacks. Other Reagan-era officials, however, have been more supportive of the film. Michael Johns, the former foreign policy analyst at The Heritage Foundation and White House speechwriter to President George H. W. Bush, praised the film as "the first mass-appeal effort to reflect the most important lesson of America's Cold War victory: that the Reagan-led effort to support freedom fighters resisting Soviet oppression led successfully to the first major military defeat of the Soviet Union... Sending the Red Army packing from Afghanistan proved one of the single most important contributing factors in one of history's most profoundly positive and important developments." In February 2008, it was revealed that the film would not play in Russian theaters. The rights for the film were bought by Universal Pictures International (UPI) Russia. It was speculated that the film would not appear because of a certain point of view that depicted the Soviet Union unfavorably. UPI Russia head Yevgeny Beginin denied that, saying, "We simply decided that the film would not make a profit." Reaction from Russian bloggers was also negative. One wrote: "The whole film shows Russians, or rather Soviets, as brutal killers." While the film depicts Wilson as an immediate advocate for supplying the mujahideen with Stinger missiles, a former Reagan administration official recalls that he and Wilson, while advocates for the mujahideen, were actually initially "lukewarm" on the idea of supplying these missiles. Their opinion changed when they discovered that rebels were successful in downing Soviet gunships with them. As such, they were actually not supplied until the second Reagan administration term, in 1987, and their provision was advocated mostly by Reagan defense officials and influential conservatives. The film's happy ending came about because Tom Hanks "just can't deal with this 9/11 thing,"[clarification needed] according to Melissa Roddy, a Los Angeles film maker with inside information from the production. Citing the original screenplay, which was very different from the final product, in Reel Power: Hollywood Cinema and American Supremacy Matthew Alford wrote that the film gave up "the chance to produce what at least had the potential to be the Dr. Strangelove of our generation". In his 2011 book Afgantsy, former British ambassador to Russia Rodric Braithwaite describes the film as "amusing but has only an intermittent connection with historical reality." The film depicts the concern expressed by Charlie and Gust that Afghanistan was being neglected in the 1990s, following the Soviet withdrawal. In one of the film's final scenes, Gust dampens Charlie's enthusiasm over the Soviet withdrawal from Afghanistan, saying "I'm about to give you an NIE (National Intelligence Estimate) that shows the crazies are rolling into Kandahar." As he says this, the sound of jet airliners soar overhead, a premonition of the coming 9/11 attacks. George Crile III, author of the book on which the film is based, wrote that the mujahideen's victory in Afghanistan ultimately opened a power vacuum for bin Laden: "By the end of 1993, in Afghanistan itself there were no roads, no schools, just a destroyed country—and the United States was washing its hands of any responsibility. It was in this vacuum that the Taliban and Osama bin Laden would emerge as the dominant players. It is ironic that a man who had almost nothing to do with the victory over the Red Army, Osama bin Laden, would come to personify the power of the jihad." In 2008, Canadian journalist and politician Arthur Kent sued the makers of the film, claiming that they had used material he produced in the 1980s without obtaining the proper authorization. On September 19, 2008, Kent announced that he had reached a settlement with the film's producers and distributors, and that he was "very pleased" with the terms of the settlement, which remain confidential. The film was released on DVD April 22, 2008; a DVD version and a HD DVD/DVD combo version are available. The extras include a making of featurette and a "Who is Charlie Wilson?" featurette, which profiles the real Charlie Wilson and features interviews with him and with Tom Hanks, Joanne Herring, Aaron Sorkin, and Mike Nichols. The HD DVD/DVD combo version also includes additional exclusive content. ^ a b "Charlie Wilson's War (2007)". Box Office Mojo. Retrieved 2010-12-19. 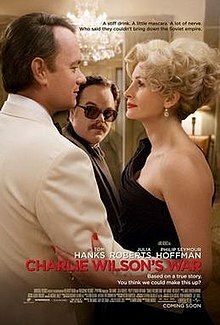 ^ "Charlie Wilson's War (2007) - Weekend Box Office Results". Box Office Mojo. Retrieved 2008-05-02. ^ "Charlie Wilson's War (2007)". Rotten Tomatoes. Retrieved July 25, 2017. ^ "Charlie Wilson's War reviews". Metacritic. Retrieved 2007-12-21. ^ Johns, Michael (January 19, 2008). "Charlie Wilson's War Was Really America's War". Blogger. Retrieved August 20, 2013. ^ Александра Шевелева (2008-03-18). "BBC: A film not for everybody (in Russian)". BBC News. Retrieved 2013-06-29. ^ Bierbaum, Tom (February 10, 2008). "'Charlie' won't play in Russia". Variety. Retrieved April 11, 2008. ^ Sageman, Marc (2004). Understanding Terror Networks. University of Pennsylvania Press. ISBN 9780812238082. ^ "Did the U.S. "Create" Osama bin Laden?". US Department of State. January 14, 2005. Archived from the original on March 10, 2005. Retrieved March 28, 2007. ^ Kengor, Paul (January 12, 2008). "Whose War? Separating Fact from Fiction in 'Charlie Wilson's War'". American Thinker. Retrieved June 29, 2013. ^ Johnson, Chalmers (2010). Dismantling the Empire. Metropolitan Books. p. 90. ISBN 0805093036. ^ Alford, Matthew (2010). Reel Power: Hollywood Cinema and American Supremacy. Pluto Press. p. 81. ISBN 9780745329833. ^ Rodric Braithwaite, Afgantsy: The Russians in Afghanistan, 1979-89. Oxford: Oxford University Press, 2011, p. 384. ^ Hartley, Matt (April 26, 2008). "Charlie Wilson's intellectual-property war". The Globe and Mail. Retrieved August 16, 2013. ^ Droganes, Constance (September 19, 2008). "Arthur Kent settles suits over 'Charlie Wilson's War'". CTV News. Retrieved August 16, 2013. ^ "Hollywood Foreign Press Association 2008 Golden Globe Awards for the Year Ended December 31, 2007". goldenglobes.org. 2007-12-13. Archived from the original on 2007-12-15. Retrieved 2007-12-16. ^ "Charlie Wilson's War". DVDactive. Retrieved 2008-02-10.